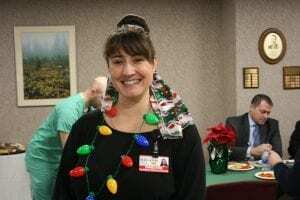 On December 11, Albany Memorial Hospital held its annual holiday gathering for staff. Colleagues were able to eat delicious food, spend time with one another, and reflect upon the success of the past year. Many thanks to the food and nutrition staff for preparing a wonderful meal which helped to make the event a festive and memorable occasion. Thank you to all of our employees for all you do every day! View the photo album on the St. Peter’s Health Partner’s Facebook page or Flickr! page.